As November 1st approaches, many Mexican and Mexican-American communities are preparing for Día de los Muertos. During this celebration, loved ones are remembered, ofrendas are built, and cemeteries are illuminated all through the night by an assortment of candles. Yuridia Bahena, Re:Own Program Manager, emphasizes the importance of celebrating Día de los Muertos and of the staple food of this celebration: pan de muerto. Pan de muerto is full of deep meaning, and is made as an offering for your muertos- or loved ones who have died. In many regions, the bread is made in a circular form representing the circle of life and death, with huesitos on top representing bones. In other places, like Yuri’s hometown in Guerrero, pan de muerto is made in the form of a muñequita, or a tiny figure representing a loved one. 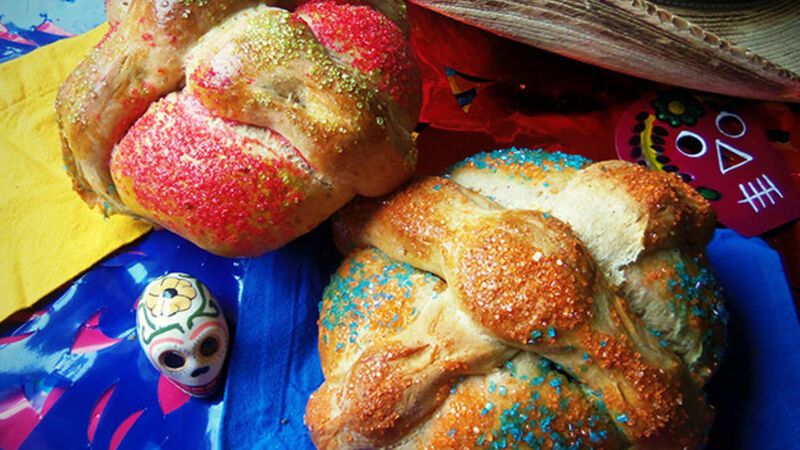 After baking, pan de muerto is topped with a variety of decorations ranging from brightly colored sugar to floral designs to sesame seeds. In México, ofrendas are decorated for the departed. Families use flowers, pan de muerto, photos, saint figurines, candles, and favorite foods and drinks to create a space to honor their loved ones. Growing up, Yuri helped her mother, aunts, and grandmother to prepare pan de muerto and to sew napkins with the names of their muertos on them. Neighbors would exchange their pan de muerto the week before Día de los Muertos. Yuri recalls that on November 1st, everyone in her neighborhood would open up their houses to show off their ofrendas. Her cousins would come in from the city for the celebration, and they would visit all of their neighbors and their ofrendas. The first year after someone had died, the ofrenda would be large and elaborate to pay special honor to that family member. That night, the cemetery would be lit with many candles as families joined together to welcome their muertos. Yuri remembers that small white butterflies would fly in a large flock into the area, and her grandmother told her that these were the souls of children who had died, returning to their loved ones. She also describes the wonder of the celebration: drink levels getting lower and food tasting different after the muertos had visited. She laughs, saying it sounds unbelievable but that it’s true! Día de los Muertos is a holiday filled with rich tradition and symbolism, and is something beautiful to be passed down through the generations. Yuri will be featured at Westwood’s very own celebration: Muertos en Westwood. She will be leading two cooking classes on making your own pan de muerto!